Do you Need a Dive Knife? What Is a Dive Computer? Do we really need a dive knife during a dive? And if so, what is the best dive knife to bring? So many questions. As with a dive light, many of us divers tend to forget to carry a scuba divers knife with us on a regular basis, and can sometimes end up regretting it! A diving knife can save your life in emergency situations, or even come in handy as a useful tool whilst underwater, being an essential part of scuba diving gear. But why do we even carry diving knives in the first place? And what makes a good divers knife? There are many reasons. One of them, being able to cut an entangled animal out of a bundle of line or netting is a great way to help our oceans. This is certainly one piece of scuba gear that is definitely better to have and not need than to need and not have. We will guide you to find the best dive knife on the market according to how you plan to use it. We also recommend you look into where the best place to store your dive knife is during a dive. Our goal is to help you find the best scuba diving knife that fits both your needs and budget. To help you out with the process, we have put together a list of scuba dive knives in order to help you find exactly what’s the best diving knife for you. In another post in our blog, you’ll also find maintenance tips for your dive knife too. What Material of Divers Knife should I Buy? What Size Scuba Knife should I Buy? What Types of Dive Knife Blades are there? What Shape of Blade should I Buy? What is the Tradition of the Dive Knife? Where should I attach my Dive Knife? Is there an Alternative to using a Dive Knife? The Cressi Skorpion divers knife is incredibly versatile. With a serrated edge, great for cutting through harder materials, this product can be sold with either a blunt or sharp tip. The blade is made from stainless steel making it much easier to sharpen. Overall this is an extremely affordable scuba divers knife. The Aqua Lung Argonaut Titanium divers knife is designed to be the toughest and the best of the Agua Lung’s knives. This blade is cut into two styles, the Spartan and the Blunt. The handles are wrapped in order to provide a spot for the forefinger to provide extra grip for the sheath. This is a fantastic option if you are looking for the best scuba knife. The Tusa X-Pert II is a high-quality scuba dive knives made from titanium. These titanium dive knives can be easily disassembled for cleaning and maintenance. It comes with a serrated edge and line cutter on one side and a sharp straight edge on the other. Being light and handy, this makes an excellent choice if you are looking for a high-quality titanium knife. The Atomic Aquatics Titanium Ti6 is a lightweight, robust full-size scuba divers knife which works excellent in most situations, with the exception of heavy prying. These titanium dive knives come with both a serrated and smooth blade for those different types of uses and has a very well-designed sheath. Making this an excellent choice if you are looking for a versatile knife that will not corrode. The Mares Force Bat Titanium is well known for its sharpness and custom-ground blade with its special serrations. These serrations make it easy to cut through a variety of different materials. Although a foldable blade, this scuba diver knife is easily opened by using one hand. If you are looking for a foldable divers knife of high quality this is the one for you. The UK Blue Tang Titanium diving knives are a really good quality knife which comes with an affordable price tag. The handle offers a good grip and can easily be dismounted without tools. It’s good to note that the sheath from this scuba diver knife can be a little tricky to unlock when using thick gloves and you might need two passes in order to cut some heavy plastics. Still, overall, a very good choice if you are searching for an affordable titanium knife. The Cressi Alligator is a great compact diving knife. This multi-purpose divers knife can be used as both knife and scissors. It comes with mounts to attach to your BCD and is small enough to be stored there when diving. Although the handle is a mere 3 inches long, the rubber inserts and wide guards provide a firm grip. This is a great option if you are looking for a multi-purpose, high-quality dive knife. The SEAC Sub Rip Tek is built with a stainless steel blade and is 6.9 inches long. This divers knife features great resistance to corrosion and wear. It is highly rated for its control on hard materials and is also good for penetration. This is a great choice for a reliable dive knife without having to break the bank. The Spyderco Atlantic is a high-quality blade material combined with a sheep-foot folder design. 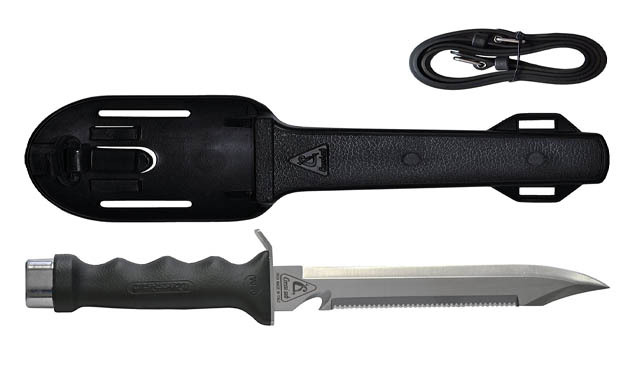 This versatile knife can be used in a wide range of situations underwater. The Atlantic Salt’s sheep-foot blade allows for both efficient and safe cutting. It has a large 14mm round hole to make one-handed opening a lot easier when using wet or gloved hands. The Cressi Orca dive knife has been designed to be used as a work tool. It comes up relatively larger and heavier than most other scuba divers knife, making the bigger jobs a lot more comfortably. Another handy feature this knife has is it has loops to attach the knife to either your leg or onto a belt. It comes with two leg straps. It’s the best option if you are looking for a knife to complete some work underwater. Most scuba knife blades are either constructed from stainless steel or titanium. These two materials are used in around 99% of scuba divers knife in the market today. Both materials, steel, and titanium are naturally corrosion resistant. Which is essential for any scuba gear, spending many hours submerged in salt water. Both materials come with pros and cons, we have broken these down for you below to help you pick the best scuba knife. Titanium diving knives are both incredibly strong and very resistant to corrosion. One of their better advantages is that they are also maintenance free. Titanium is a much lighter material, as well as stronger, so while sharpening this scuba knife will no doubtable take longer and a lot more effort to do so, the blade itself will stay sharper for longer. Any scuba diver concerned with the weight whilst traveling with their diving gear will most probably opt for a titanium model to keep the weight down and maintenance minimalistic. A steel scuba knife is the opposite, very easy to sharpen but require more maintenance in order to prevent them from rusting. Overall stainless steel is a softer metal. This type of knife usually comes in two different alloys, 300 and 400. The 300 alloy is much closer to the titanium knife, which is a little harder to sharpen but also requires a little less maintenance. The other, 400 alloy, holds its edge well but is more prone to rusting. These knives tend to be less expensive as the other titanium diving knives. Bigger isn’t always better. The size of your diving knife should be determined by how you plan to use it. For the recreational divers, a small divers knife with a simple 4-inch blade should be fine, as you will most likely be using it in the event that you get tangled up in something and need assistance in getting free. If however, you plan to use your scuba knife while spearfishing, cutting lines underwater or kelp diving, you will need to opt for a different size depending on your specific situation. The best divers knife can be found with a fixed blade or with a folding blade. These options of scuba knife really do come down to personal preference. We have broken these two options down for you to highlight their difference. Dive knives which come with a fixed blade usually come with a sheath for you to be able to store it safely. The main advantage of this type of blade is that you can easily take it out by using just one hand. Dive knives which come with a foldable blade, are a lot smaller and lighter than the fixed blade knives. Many of these also lock into the position preventing you chopping your fingers off whilst using it. However, they can be difficult to open when using just one hand. When choosing the blades shape of your divers knife there are two main parts to look at. These are the edge and the tip. The edge of the blade of a scuba knife can be straight or serrated. A serrated blade will perform better for helping to cut kelp and natural fibers, while a straight blade is better in cutting plastics or nylon rope for example. Don’t worry too much about this, many knives offer both straight and serrated edges in order to give you the option of both. The tip of the blade of a divers knife can be sharp, blunt or tantohalfwayay between the two). For digging, hacking and prying a blunt tip works best. Sharp tips are a popular choice for activities such as spearfishing as the sharp tip is great to cut and puncture. However, these tips are more likely to cause accidents whilst diving and are not recommended for recreational divers for this reason. Many divers tend to ask the question when looking at various models of divers knife these days. Ultimately, it all comes down to what you are looking to get out of your scuba knife. For the divers looking for the most versatile dive knife, which is primarily going to be used as a cutting tool, a blunt tip would be the best choice. By purchasing a dive knife with the squared off tip makes it not only a great cutting tool but a powerful prying tool too. Any diver doing some maintenance diving such as underwater welding, or boat cleaning a blunt tip is the way to go. For the more sporting divers, such as spearfishers, a sharp tip seems the most appropriate. Many spearfishers like to have a sharp tip divers knife to hand so they can use this as a killing knife out of respect for any fish they spear, in order to end the animals suffering quickly by using the sharp tip. So where does this tradition come from? Many people seem to think that dive knives are used to ward off sharks and giant deep sea monsters, just like when they use them in the films, but believe it or not, divers knife are primarily used as a tool to free ourselves from entanglement in plant life, rope or even lines. Having said that, we can often free ourselves in this kinds of situations by moving slowly and ideally with some help from your buddy. The Dive knife is essentially part of our safety kit. Dive knives are often seen being used when helping to free marine life from such entanglements too. Knives are traditionally worn on the calf, where they can be attached by a rubber strap. This tradition stems back to the commando swimmers and frogmen of World War II. Over the recent years, where to attach your scuba knife has been a very hot topic. Traditionally, the most common place to attach you divers knife is on the lower leg, opposite to the dominant hand. Which as mentioned above, stems from back to the commando swimmers and frogmen of World War II. The disadvantage of placing your scuba knife of the lower leg is that it can easily get entangled with things underwater whilst scuba diving. Nowadays, many divers prefer to carry their diving knives on their BCDs (buoyancy control device). We have a wide range of BCD designs making it a more preferable placement for a knife. In order to make this work, a smaller knife is often desirable. This locations also makes it easier to ensure you never leave it behind on the boat and is in an easier place to reach in case you might need it. The fascination with dives knives is actually rather interesting, especially when taking into account the fact that many experienced divers do not actually even carry dive knives, they opt for trauma shears instead. What are trauma shears? Trauma shears are a type of angled scissors which have several advantages. They are commonly used by paramedics and other emergencies medical personnel to quickly and safely cut clothing from injured people. One of the advantages of the trauma shears are that divers are highly unlikely to cut or stab themselves with them, which can occasionally occur with dive knives. A small puncture wound can become a big problem, especially if you are using a dry suit and have gotten a hole in it. Another advantage to using shears is that you can use them in most cases with just one hand. In order to cut a line with a knife, you need to keep it taught by holding the line with one hand and using the other to cut it. Whereas a pair of shears can easily cut a line that is slack. Let us know what you kind of dive you have in your scuba gear by leaving a comment below. Scuba diving is more than a passion to me, it's a part of who I am. Since the day I took my very first underwater breath, I knew that my life would be focused around the ocean and everything that belongs to it. Now, I travel and dive as much as I can, exploring the rest of the world, trying new dive gear, discovering dive destinations and reviewing them here for you. All while educating people of the threats our marine life and oceans face every day and what we can do to help defend it. Cool article. I never knew how to choose the best dive knife, or which blade to opt for, so this has really helped me. Thanks! I am looking at getting the Atomic Aquatics Titanium Ti6 dive knife, does anyone recommend this one? I purchased the Cressi Alligator dive knife a couple of months ago and I love it. Couldn’t recommend it more. Great content on dive knives here. I always wondered if I really needed to get one, but I think you have convinced me to. Like you have mentioned, it’s always better to have one and not need it than to need it and not have one! I'm Kirsty and I dive, travel and blog. I love learning new things about the ocean and marine life that live within it, all while inspiring others to help protect it! Is a Snorkel Necessary for Scuba Diving? Subscribe for the latest posts, tips & events. @2019 - Ocean Scuba Dive. All Rights Reserved.